That’s an old expression that came to mind yesterday morning as I was finishing my herb garden. 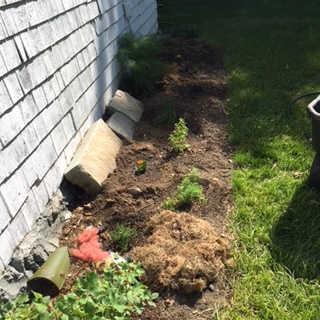 Gardening brings several of my favorite activities together: planting and growing of course, chickens who contribute aged bedding and manure for fertilizer and soil amendments and even wool leftover from combing which I use for mulch. I also use grass clippings. The last three are just sitting around with no other purpose so I feel good about using them rather than wasting. Rather than spending money on materials that do the same thing. Even I don’t want wool showing in the garden so I cover it with grass clippings. Wool will protect and takes a long time to break down and I will have to replace the grass clippings before I need more wool. We don’t lack for grass clippings on this acre. In the front of the picture you can see the layer of wool on the left. It is covered by grass on the right. It was supposed to get hot today- to me 78 degrees feels a bit too hot- so I was out early as can be seen by the shadows. Does anyone know what this is? I don’t. We have a collection of items found on the property by the previous owners and some we and the chickens have dug up- hand forged nails, small bottles, broken pottery- and I just dug this up in the herb garden. 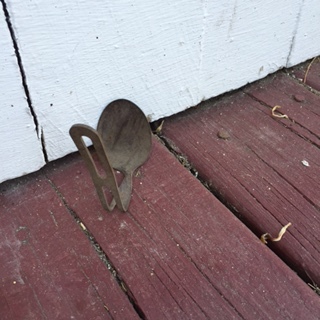 It looks like a spoon but the bent handle has slots which a spoon would not have. Back in the 1830s-not that this is likely that old- when the house was built and for a very long time afterwards people weren’t putting their trash out for the town haulers to pick up. 🙂 They were burning it and burying it. They had much less waste from packaging and other things than we have. Since this was behind the barn it could have fallen off of something too. 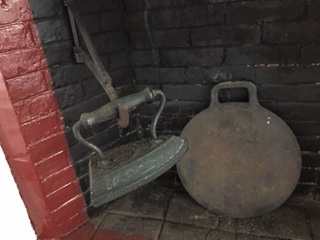 We also have a large two person saw, and an old oil lantern that were used here. I enjoy thinking about the people being right here where I am, using those things. Our fireplace has a metal arm that swings out to hold a cooking pot or an iron. Swinging arm original to fireplace for irons and pots. We have a couple of those irons. They are so heavy! The women must have developed arthritis and all kinds of other problems with their shoulders and arms after hefting those things. Unless they were like me and avoid ironing at all costs. They didn’t really have that choice though. Thinking about all these items and activities happening here long ago makes the expression in my title come even more alive. I like it because it gets my creative juices flowing. What can I do to complete an activity and not have to buy much, or maybe anything? What can I use or create from things that I have already? That expression likely came about long ago from people who did not have the material wealth to buy whatever they needed. Or a Walmart nearby to sell it to them. We have many more options and often they come in handy. But do we need to always use those kinds of options? Or can we be more creative and less wasteful? 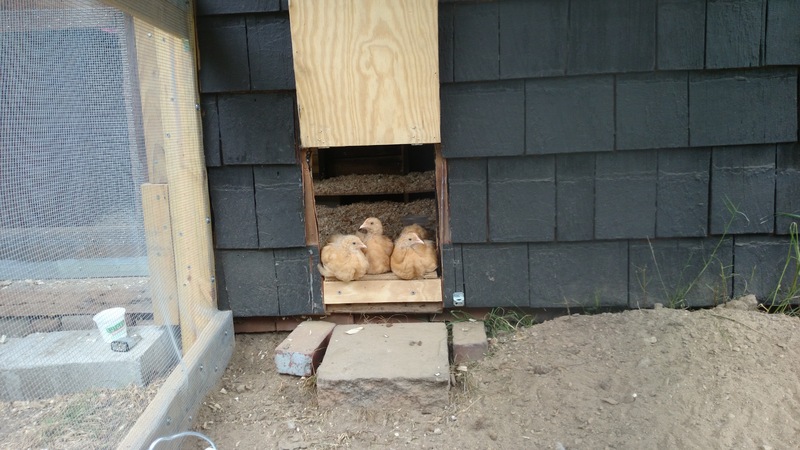 Chicks almost two months old July 2014. Thanks for the picture Laura! I know I will be wasteful with certain things such as my chickens. I am sure that the chickens kept here long ago in the same hen house we now use were eaten once they stopped laying eggs. It makes sense. But in 2015 I don’t need to eat them in order to survive. So I guess I pick and choose my wastefulness! But look how cute and goofy they were ten months ago. Who could eat this even now that they are full grown? People more sensible and practical than me, people who were masters at surviving by using what they already had at their disposal, that is who. We can only marvel and sometimes learn. No one is eating you! And be grateful we don’t have to iron with hot 8 pound irons. Next week back to wool and sheep! 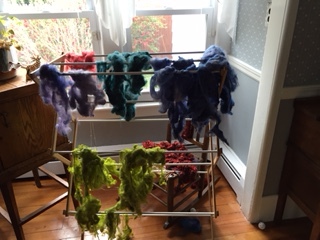 There has been a lot of dyeing here today. About half of the dyeing I did today. The rest is still cooling. 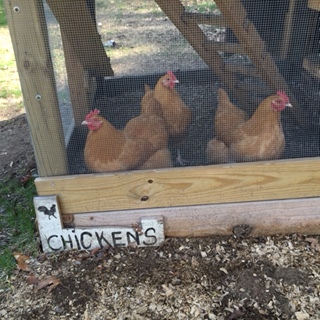 This entry was posted in Uncategorized and tagged being frugal, Buff Orpington chickens, fireplace cooking, garden mulch, gardening, hand dyeing, hand spinning, herb gardens, life in 1800s, old houses, self reliance, self sufficiency on May 12, 2015 by Betsy Alspach.